Andrews McMeel Publishing, 9781449495213, 176pp. 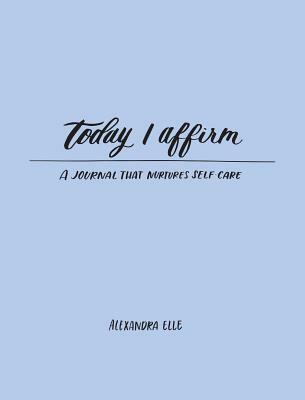 From Alex Elle, celebrated poet and author of Neon Soul and Words from a Wanderer, comes Today I Affirm—a journal and guide to reading and writing daily affirmations. Writing serves as a form of meditation. When we slow down and settle into ourselves, affirmations can assist us in self-awareness, introspection, and understanding. Today I Affirm helps walk readers through the ins and outs of cultivating positive self-talk in a way that is stress-free and easy to understand. This innovative book includes affirmations written by the author, short bits of inspiration, charts to fill in, as well as journal pages all with the focus on self-care. Alexandra Elle is a writer and creative living in the Washington, DC metro area with her husband and two daughters. In her pre-teen years, writing came into her life by way of therapy and the exploration of healing. Many years later, Alex's voice and words are being shared poetically in the form of self-love and self-care. Her passion for storytelling, poetry, and narrative writing are infused with life lessons, self-celebration, and building community through reading, writing, and language.